Becoming a CNA is not a pathway to professional nursing. It's not possible to tell if the unit will be shut down. I have worked on two,where millions of bucks were spent on renovations... only for them to be quickly closed. " I was hired I was under the impression that I would eventually get to work my 3 12 hour shifts back to back so I could spend more time with my family. But they have me flopping between 12 hr day shift and 8 hr evening shifts. " Soo.. they are using and abusing the few remaining staff members. I would transfer STAT. Best wishes. Initials and education do not necessarily make a good leader. There is something in your leadership style that management does not want. Management won't tell you, but your most trusted coworker might. Hmmmm, are we talking about Clark? There is no single med error worth giving up your nursing career for. "I’ve been anxious and depressed lately at baseline since my dad died and all these life changes happened. " I can feel that pain. My dad died... I got a divorce ... it was hard to keep on in our care giving role. If you are still anxious and depressed... please seek professional help. "I mistakenly thought the plan was to d/c the insulin gtt because it was now in the TPN." That is an error in judgement that may or may not, have anything to with your emotional state. You did not see an order to DC the insulin drip. Please take care of yourself . Grief presents many challenges. Best wishes. Marie sounds like your classic long term dangerous patient. Clark sound like your new dangerous co-worker. Marie cannot process that she is dangerous, Clark can. You have to make that clear to him. Good luck. I felt like a worked a double just reading your post. Have you been ACCEPTED to the RN program? Any tips for a clinic setting nurse? NEW GRAD. How much orientation was provided on the EMR ? It takes a couple of weeks with full time training to become adequate with charting. The travel agencies I worked for handled most of the paperwork and paid the fees. After all, they don't get paid, until YOU work. Keep looking until you are treated like the gold mine you are. Please see the home health nursing forum here. It all depends on the employer. There are thousands that want your skills. If the employer is advertising as "field" nurse.. it is a red flag. There are hundreds of agencies that will pay you $35 per visit... because THEN they profit $35 for your visit. You will not be a "field nurse", your will be providing home care. I tried it briefly. I had 20+ years of experience. I was the only set of eyes on that patient... scary stuff. Check out your payment for travel time and wear and tear/ gas on your vehicle. Also.. the documentation is brutal. One visit... 20 pages on your own time. Best of luck whatever you go with. Of course you can have children. Per the contract.. you cannot work for the company... while you take care of your kids. Your facility , most likely has the protocol to only hold your position for three months. Sounds like your manager is understanding and may or may not offer you a new position. I also had an ankle injury... couldn't walk for six months. I went on to many interesting and lucrative positions. Do you have an attorney that can sue the pants off of the van driver? You worked hard for you credentials. Don't give up on nursing.. just because your first job is not so hot. 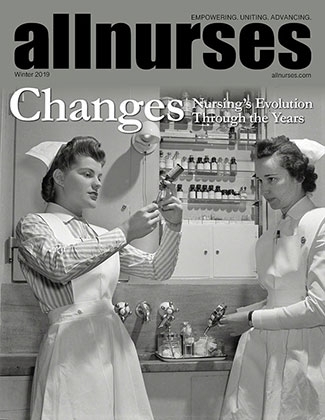 Please see the first year of nursing forum here on AN. You are a nurse! Many opportunities await you. Best wishes. Less hours will equal less social security benefits. Consult a financial advisor, it is free and the advice is priceless. I certainly agree ALL policies and procedures cannot possibly be followed to the "t". However, you can bet your sweet tookas that blood administration is being closely monitored... and errors will come back to bite that sweet tookas. I have never heard of nine nurses in a group interview. Sounds like some new HR hoopla. These nurses don't all know how to interview, most of them didn't want to be there. Ya gotta forgive them. I would never turn down a job offer, especially PRN. If offered.. give it a shot. Best wishes. In order to get off the hamster wheel, you HAVE to try another job. You have many options available to you. I was 60 years old when I had enough with floor nursing. I had already done the travel and agency thing. I went onto insurance work, working from home. Best wishes... change is good. Health care and nursing care are now corporate owned. Corporations do NOT give a rat's patooti about safe patient care. They care about their profit margin. The answer is fight for legislation for safe staffing ratios. Vote for the legislators that have the same ideals. It IS addressed in your policy and procedures. You just need to find it. Strangers on the internet... will not cover your practice. Blood administration is never a simple issue. Transfusing blood is as serious as it gets. Review your policy and procedures STAT. If your company won't let you have a dog, that is a problem. That's one of the perks of the job! She was able to be at home with her master. Yes.. I let my dog in and out . My company even gave me PTO when she was dying. How long did you hold the second position? THAT is the colleague's problem, don't make it yours. If she wants to remain petty and vindictive , your best bet is to ignore it. By the way, precepting is not a badge of honor, it is mainly a pain in the tookas. Is it bad to turn down an interview in 3 days after having agreed to it? Never turn down an interview. Recruiters do not know what is going on in the minds of the managers. You never know what offer will come from that interview. I was in a similar situation, I politely declined the night shift position... was then offered day shift. Good luck.